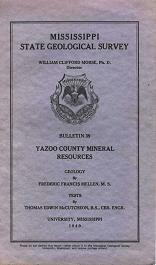 A report on the purely scientific stratigraphic study of the county that led to the discovery of the Tinsley Dome, eventually to the drilling of the first commercial oil well in the state, and a report on the tests of the clays. Author(s): Frederic Francis Mellen, M.S. & Thomas Edwin McCutcheon, B.S., CER. ENG.